Vandivert, LIFE reported, "found almost every famous building [in Berlin] a shambles. In the center of town GIs could walk for blocks and see no living thing, hear nothing but the stillness of death, smell nothing but the stench of death." Above: A never-before-published aerial view of bombed-out buildings and wrecked gasworks in and around the Schöneberg section of Berlin. 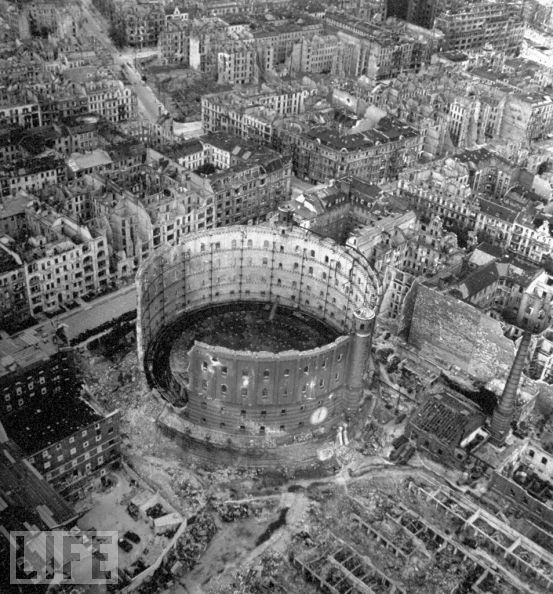 Between August 1940 and March 1945, American, RAF, and Soviet bombers launched more than 350 air strikes on Berlin; tens of thousands of civilians were killed, and countless buildings -- apartment buildings, government offices, military installations -- were obliterated.